Floor Space: 4 ft x 2ft. Floor Space 10 (250 mm): 4 ft. x 4 ft.
We have marked a dynamic position in the market by providing the finest quality range of Table Top Label Rewinder Machine. Since the inception of our organization; we are offering Label Slitting Rewinding Machine to the customers. This Label Slitting Rewinding Machine is packaged in the best quality material before this is made available in the market. 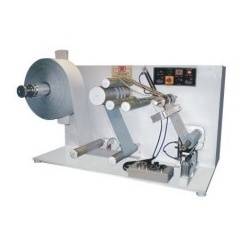 Moreover, this Label Slitting Rewinding Machine is offered to the clients at reasonable prices. The range of products offered by us is inclusive of various food and pharma products such as Table Top Label Rewinder. We have carved a niche amongst the most trusted names in this business, engaged in offering a comprehensive range of Label Rewinder. Winding Direction: Both Clockwise and Anti-clockwise. 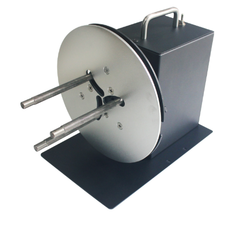 Winding Speed of the product: Adjustable with speed controller (regulator) to match any printer. Controls: Easily reachable On/Off switch. Max Roll Weight: 3.5 Kg. Owing to our huge market knowledge, we have been able to offer our valued clients with a wide range of Godex Label Rewinder. Winding Speed: Adjustable with speed controller (regulator) to match any printer.